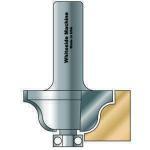 Some of the most popular Whiteside bits fare the Roman ogee router bits. Woodworking pros use these bits choose to add a decorative edge to any project. These 1/4" or 1/2" shank carbide-tipped router bits can be used in both handheld and table mounted routers. These Roman ogee router bits are manufactured by the award-winning Whiteside Machine Company. If you don’t see the tool you need for specialized woodworking, contact us and we’ll do our best to locate it for you. 5/32" 9/16" 1-1/8" 2" 1/4"
1/4" 11/16" 1-1/2" 2-1/4" 1/4"
5/32" 9/16" 1-1/8" 2-1/4" 1/2"
1/4" 11/16" 1-1/2" 2-3/8" 1/2"
3/8" 1" 2" 2-3/4" 1/2"